15 minutes before your arrival at terminal T2 of Madrid Barajas Airport, call the telephone number that you will find in the email confirming your reservation. Confirm your reservation with the tele-operator, the time of arrival and the airport terminal where your vehicle will be picked up. The tele-operator will give you the necessary instructions and coordinate with the driver to pick up the vehicle. 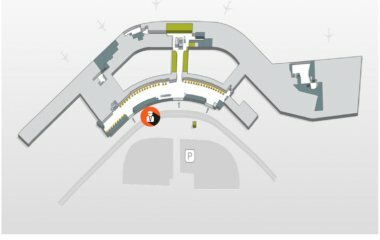 The pick-up of your vehicle will take place in terminal T2, in the Exits area in front of the last Door, as indicated in the diagram of T2. The parking personnel (in orange uniform and with the company logo) will pick up your car and take it immediately to their facilities where it will remain parked and guarded until your return. When you return, call the same number when you have recovered your luggage and you are out of the customs environment and you are allowed to do so. The teleoperator will coordinate with your driver the delivery of the vehicle. The driver will be waiting for you in the departure area of Terminal 2. Alternatively, the car park offers you, if you wish, a free shuttle service by minibus to the car park to pick up your vehicle. Height: 9m. Width: 3m. Length: 7m.